Life at SKY is life at the peak of urban living in Edmonton. The Stantec Tower, Western Canada’s tallest tower, combines it all with 37 residential floors atop office and retail. Living at SKY Residences at ICE District means more than everlasting views of the skyline — here are the five things you don’t know about Edmonton’s tallest tower. The extravagant lobby at SKY is more than an entrance — it’s your connection to the rest of Edmonton’s bustling downtown. The pedway that connects the downtown core extends to Rogers Place and beyond, allowing you complete access. Live amidst over 40 km of indoor pedway networks, directly linked to the Stantec Tower. Pedway or not, the tower is conveniently situated within walking distance of downtown Edmonton’s many office towers for unmatched connectivity. The bustling city is renowned for its many innovative and high-quality restaurants, as well as its exceptional nightlife. Fill your social calendar with the best that Edmonton has to offer, with world-class entertainment, nightlife, and restaurants at your fingertips. The tower claims several firsts in Canada and North America. Construction of the tallest tower in Western Canada was achieved with the largest slab pour in North America between both the Stantec Tower and SKY Residences. In addition, the 30th amenity floor features a hot tub that could only be installed with the help of a crane! SKY Residences features 483 private condominium suites amongst it’s 36 residential floors, with upscale amenity floor, complete with rooftop terrace to enhance your lifestyle. Such stunning architecture doesn’t come without an eye towards environmental impact. The Stantec Tower, which SKY is set on top of, is designed to meet LEED® Gold building standards, indicating conscious use of power, water, and building materials. When complete, the ICE District will set the new standard for urban living. As part of the 25-acre development, a cutting-edge Public Plaza will be the lively centre for retail, restaurants and entertainment. The plaza will also feature space for outdoor concerts, volleyball courts, and an ice-skating rink. Whether you enjoy spending your Sunday afternoon shopping or meeting friends at the newest lounge downtown, all your needs will be met right in the heart of the ICE District. Whether you are a dedicated fan in the bleachers of Rogers Place or like to enjoy the game from the comfort of your own home, SKY has you covered. Step inside Rogers Place within minutes of leaving your home with direct access to the stadium via pedways and the tower’s underground parkade. If you feel like making it game night at home, invite your friends over to SKY’s private media lounge to take the big game to the next level. From a distance, SKY is a striking addition to the Edmonton skyline. The tower’s glazed curtain wall windows reflect shimmering sunrises and sunsets, allowing the tower to take on new, stunning colours every day. The tower’s expansive windows aren’t just beautiful from the outside, they also add an elevated experience within your suite. Coupled with sky-high ceilings, the oversized windows add brightness to the space and highlight the luxury features within the suite. The sleek design is infused throughout, from the lobby and amenity floor to the residences, with a selection of modern designer colour palettes available for your suite. Upon entering the building, SKY’s extravagant lobby leaves a lasting impression. Complete with a 24/7 concierge and security, as well as direct connection to the JW Marriot, SKY never misses an opportunity to impress. Your home is your sanctuary, but the relaxation doesn’t stop the moment you walk out of your suite. Finish your day overlooking the best of the city from the 30th floor hot tub. 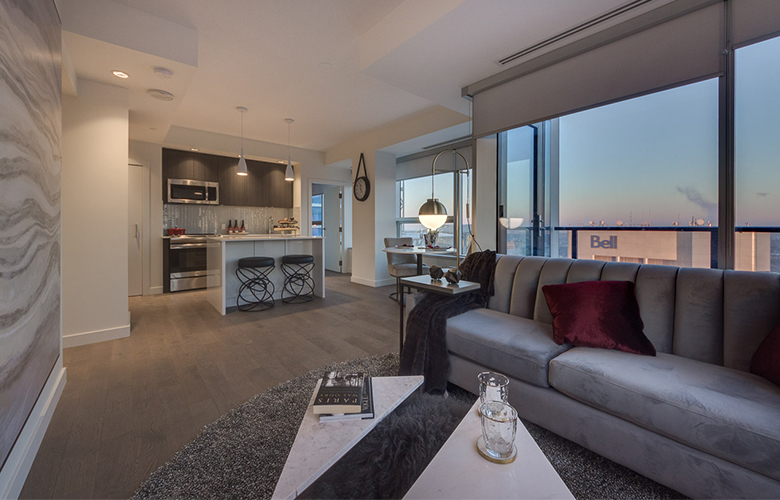 Even better, host your friends atop the Edmonton skyline on the SKY Residences private rooftop terrace, featuring BBQs and cozy lounge areas. Take your relaxation indoors to the health and wellness amenities, including a fitness facility, yoga studio, and an infrared sauna. Relax and rejuvenate before taking part in all the action of the downtown core. 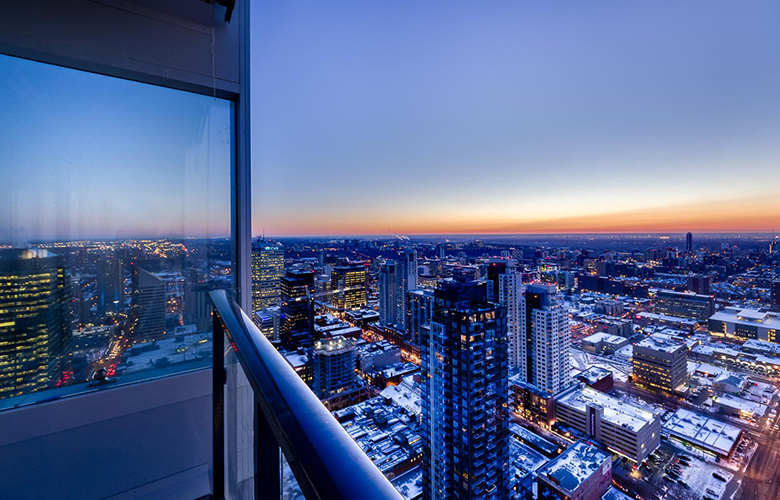 Find life among the stars in Western Canada’s tallest tower. With upscale amenities and luxury features, SKY Residences is the undeniable way to experience urban living. Live connected. Live SKY. 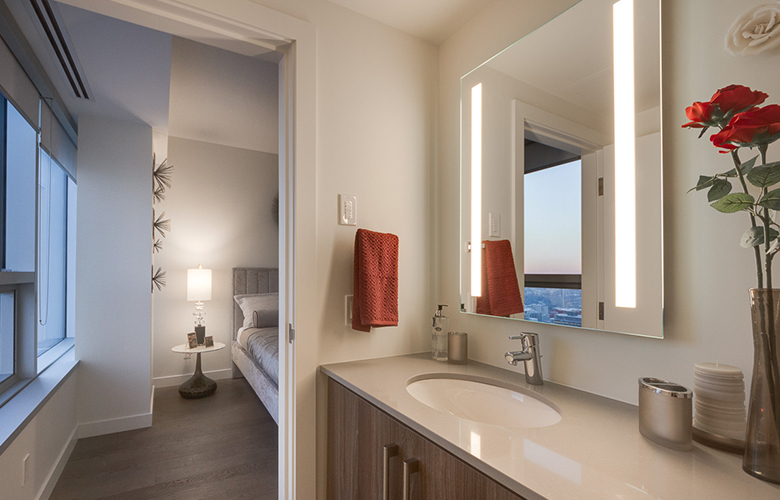 For more information on luxury 1 and 2 bedroom condos at SKY Residences, visit liveskycondos.com/ or contact us at info@liveskycondos.com or call us at (780) 426-2699 to book an appointment with our sales team.